What are you waiting for? Give this to your pooches after you have finished reading the benefits below. Coconut oil consists of 90% natural saturated fats which come from Medium Chain Triglycerides (MCTs), in another word medium chain fatty acids. Like vegetable oils consist of long chain fatty acids. Although it sounds like it has a negative stigma, coconut oil is a very healthy nutritional supplement for both human and dog’s diet because 40% of MCTs contains lauric acid (has antibacterial, antiviral and anti-fungal properties), capric acid, caprylic acid, myristic acid and palmitic. At the same time, it also contains a few unsaturated fatty acids like about 2% of linoleic acid (polyunsaturated fatty acids) and about 6% of oleic acid (monounsaturated fatty acids). In addition, MCTs help balance the thyroid and efficiently metabolized in resulting higher level of energy, enhancing physical performance, prevent from illness, speedy healing and aiding weight loss for those overweight dogs. It also improves dog’s skin and coat, aids digestion and reduces allergic reactions. Not all coconut oil are allowed for dogs. Only Virgin Coconut Oil or Extra Virgin Coconut Oil as both are unrefined oil. 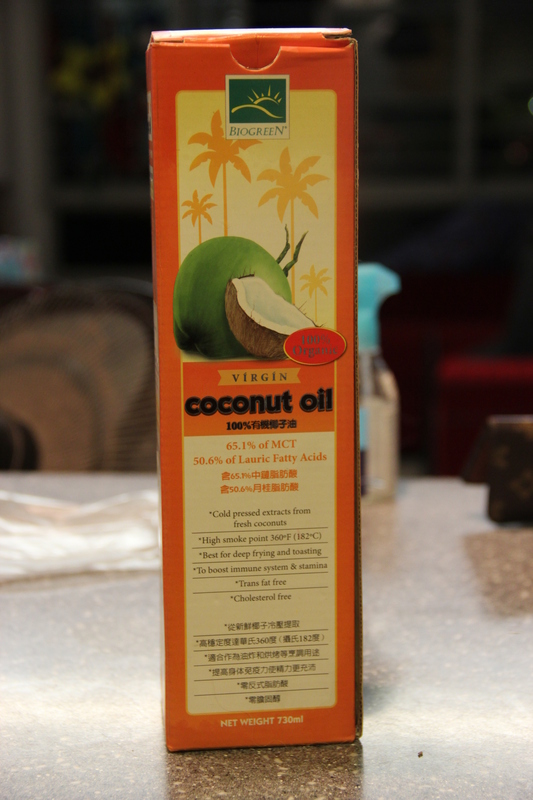 Likewise, you may also give Cold-pressed Virgin Coconut Oil or Organic and non-GMO coconut oil which are even better. Baileys and Myers are taking this brand for 1 teaspoon in alternate day. Lauric acid has the powerful antibacterial, antiviral and anti-fungal properties that fight against infection, cancer and disease. Reduces the risk of brain lesions in elder dogs. For a start, you may want to give small quantity and then increase the dose gradually to the maximum allowable dosage. If it is considered a new food, giving too much or too fast may lead to loose bowels or even cause diarrhoea while their body are still adjusting the new diet. As mentioned earlier on, coconut oil has anti-bacteria, antiviral and anti-fungal function, they may respond negatively to the detox of coconut oil. If the dog shows the signs of detoxing such as lethargy, headaches, flu, fatigue and diarrhoea, just temporarily reduce the dosage and then increase gradually. Therefore, by starting slow and steady, it will cause you with no trouble. For a start, give 1/4 teaspoon per day for small dogs or puppies and 1 teaspoon per day for larger dogs and then increase slowly over time. If they have sensitive stomach, just give a dab will do. According to internet resources, the recommended dosage for 10-20 pounds of body weight for each dog is 1 teaspoon. Although coconut oil has no negative side effect when taken, you should always seek professional opinion before adding any supplementation of coconut oil in order to know what you have given to your pooches. Like me, I will seek friends’ advice and will google it since google is my best informative friend. Most of abovethe taken from internet resources have been rephrased. This entry was posted in Healthy Stuff and tagged Coconut oil, Superfood. Bookmark the permalink.